I am an eclectic solatary witch, self taught, and self dedicated. 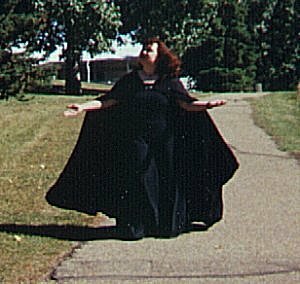 I started practicing magick when I was a small child. I enjoy nature, and love animals. All my life I have been facinated with the mystical, dragons being my favorite. If you've been looking through my site you know that I am a poet, if I dare to call myself such. I Love reading, ever since I was a child. When I was in my teens someone introduced me to the works of Anne McCaffery, I was in heaven. I currently own all her books and most of Mercedes Lackeys works as well. I am currently in the middle of writing three books, I have the middle book of the triliogy almost complete. Listed below are a few of my closest companions, I am currently working on rennovating this site. So visit back to view the changes and enjoy your stay. She is one of my dearest friends. We have known each other since we were children. She is my sister in soul if not in body. Who lurks in your dreams? Tunes out the worlds din. Who holds the old code. A friend much more then simly a friend. Merry Meet WingBrother! Seeee I finally got around to editing my site and now you have your own spot in the caverns that I call home. I hope that life finds you well in your quests. You've always been someone I know I can lean on if I need a shoulder. Increadably caring and brave, thank you My Lord. Safe winds on your Journeys. He is one of the first people I started talking to on the net about wicca he gave me the addresses for some good sites. And was always willing to talk about wicca. I havn't heard from him much lately, but I miss talking to him. She is an angel, the sweetest person you would ever want to meet. She is a pure white witch, who loves nature and animals. I don't realy know a lot about her. But you can find her in the chathouse under the name DarkLove or Silver Moon. In Memory of Silver Moon, we wish you well wherever you are and hope you are at peace at last. She passed from this world April 11, 1999 she had been battling cancer for the longest time and it was finally to much for her body to handle I know that wherever she is now, she is at peace. Another increadably close friend, both on othe net and in real time. Hedes introduced us (much to the dismay of a few males) and we've been harassing whomever we come across. We are so much alike it's scary sometimes, as some people have found out. We tease a lot, but if you do meet us (pray that you don't) you're lives will never be the same again I can promise you that. Zhai'heleva brother of mine!! *huge hugs* I'm so glad I've finally found you!! He is my brother, not of blood but of spirit. A individual of deep thought and feeling. I know how he feels, being lost and alone, unshure of where he is going, and not shure where he's been....but remember the goddess holds all of her children in her heart. There will always be one that loves you. Even if it seems like the rest of the world is out to get you, she will be there for you, as will I.
Nobel, loveing, fearless, and caring. All of the qualities I admire and strive for. He can be as fearsom as his namesake the Tiger, or as gentle as a breeze. He is one of those that you feel safe around, with him it is like standing in the eye of a storm. All around you the winds of the world may howl, but with him there is calm and peace. He is my Angel, and my friend. To him I bow and lift my hat. A true poet, and friend. I have great respect and admoration for his work. And one day hope to write such moving works as he does.